Hello! 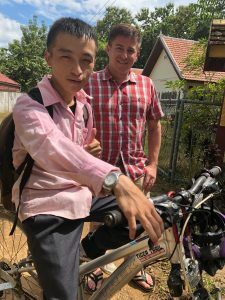 I am Mr Ai Her, l am the disabled man in Laos, the man who got the new bike. I am really proud of my new bike because it’s a bike that belongs to me. I can ride it to school. I have never ridden any bike before because if I rode them l would fall down, so I was really scared to ride them. Ai Her and David (School IT Volunteer). If I wanted to go somewhere, I usually had to beg my friends to take me to where I wanted to go, otherwise I had to walk. Sometimes, my friends were busy, and they couldn’t take me to where I wanted to go. Ten years ago I walked alone everywhere because I walked very slowly so nobody would want to wait for me. I spent my life living alone with my parents for as long as possible because I didn’t have any friends. Now l have my new bike that I can ride, maybe l will not be alone again. I can now ride my bike to go out with my new friends. I would like to say thanks to my teacher, Jeannette who is the Director at the LEOT Centre, Peter, David, and teacher Bounchanh. I also want to thank the man from Tiger Trail who worked with us to make my new bike and to Carol @My Library who had the idea of getting a bike that I could ride. I will not forget these things that you have helped me with today, until my last breath. And one more thing, I would like to say that you all are my saviours, if none of you were here, I can not get my bike and l would still walk alone everyday. Therefore I, Mr Ai Her would like to thank you very much for your help. I bless you all and wish you good health. My English is still not good enough so maybe my writing isn’t correct, but l hope you all will forgive me.